Among multimeters one instrument stands far and above the rest. An object desired for its accuracy, resolution and shear engineering beauty. I speak of course of the HP 3458A. That’s right, not Keysight, not even Agilent (though of course it goes by those brands too). The 3458A was released in 1989, when HP was still… well… HP. An elegant meter from a more civilized age. As the HP Journal documents, the 3458A was a significant engineering feat and has remained in production (and largely unchallenged) for the last 26 years. But what, you might ask, makes the 3458A such a significant and desirable instrument? It’s all in the digits. The 3458A is one of the few 8.5 digit multimeters available. It is therefore sensitive to microvolt deflections on 10 volt measurements. It is this ability to distinguished tiny changes on large signals that sets high precision multimeters apart. Imagine weighing an elephant and being able to count the number of flies that land on its back by the change in weight. The 3458A accomplishes a similar feat. While many engineers might desire the 3458A, it is an object of fascination to one particular group. I speak of course of the cousin of the time nut… the volt nut. Time nuts often find themselves needing to conduct highly accurate voltage measurements in order to calibrate their precision frequency standards and thus spawned a separate mailing list to discuss these topics. Much of the discussion on this list centers around the 3458A, how to calibrate one, long term stability measurements, and how to care for their beloved meters. And of course reports of the occasional auction score (I have to admit to eyeing these jealously, after spending hours trawling eBay for a bargain and ringing numerous surplus stores). At the heart of the 3458A lies a precision voltage reference. Voltages references are in principle quite simple devices, their goal is to output at all times an exact precise stable voltage of a known value. References have numerous applications but in the 3458A it’s used as part of its multislope ADC. The input voltage is effectively compared against this reference value in order to determine the input voltage. Its accuracy is therefore of paramount importance. The LTZ1000 is an ovenized zener reference. You’re no doubt familiar with zener diodes and their clamping applications (if not Afrotechmods has a great tutorial). It’s their ability to “clamp” an input voltage to a specific lower value that makes them ideal for use as references. The zeners “clamp” (reverse breakdown) voltage varies with temperature. For better stability the LTZ1000 therefore uses an on-die resistive heater to keep the diode at a constant temperature (much like an ovenzied oscillator). The LTZ1000 has found favor with voltnuts seeking to build precision references using this part. Some have used the reference board from the 3458A. But others, like TiN have designed their own. TiN has documented his work in exquisite detail over on the EEVBlog forums, describing not only the PCB layout but also extensive thermal modeling. That is what you see pictured above. Izumo Sangyouza has also been building LTZ1000 references. though unlike TiNs, few details are available, the boards look awesome however and though the forum posts are in Chinese, the videos included stand as testament to the accuracy of his references. But Izumo’s blog holds an additional surprise for the avid volt nut. The picture below perhaps says all that needs to be said. The multimeter shot below uses the AD5791 in concert with a stable reference to provide incredible precision. While the post doesn’t specify, it’s a safe bet that one of Izumo’s LTZ1000 voltage reference boards is being used in this case. Having recently played around with the AD5791, I can only stand in awe of Izumo’s work. The LTZ1000 is the best generally available reference and the 3458A the best meter. But one question remains, what do you use to calibrate it? The answer is to turn to basic physics, in this case the Josephson junction. The Josephson junction is formed from two superconductors separated by a thin insulating barrier. When cooled with liquid helium these junctions exhibit complex non-linear behavior, such that a frequency applied to the junction can be converted into a precise voltage. Luckily, producing highly accurate frequencies is something we’ve become very good at. Cesium standards (so called atomic clocks) are used together with the Josephson junction to create highly accurate voltage references. The IEEE have create a video on the basic physics and the evolution of the Josephson junction. Through the efforts of Quantum Electrical Metrology Division and others, chips incorporating thousands of such junctions on a single device have been fabricated and provide standard values accurate to within nanovolts. This basic physical property is now used to calibrate all precision multimeters. There’s one final twist in the story of the volt nut. While most of our measurement standards are based on a fundamental physical property the standard kilogram is a lump of metal which sits in a vault in Paris. This is of course, pretty unsatisfactory. Over the hundreds of year that this lump of metal has been sitting around, it has lost mass as it has been cleaned and handled. Standards communities now seek to replace this with an “electronic kilogram”. Their system balances the mechanical power of a weight under gravity and the force exerted by an electromagnet. This electrical power is of course measured in terms of the Josephson standard volt. Brian Josephson won the Nobel prize for his contributions to the development of the Josephson junction reference, perhaps making him the ultimate volt nut. But for now such references lie outside the domain of the average hacker. Perhaps someday, like atomic clocks before them, industrial applications will drive the price down so that every volt nut can have their very own standard. Until then the quest goes ever on. There is also a fun video that has some footage of the real watt balance. Great article! Really enjoyed it. Good article, but a tip of the hat to the 3458A’s sister product, the 3457A, would have been a good addition. It is only 7.5 digits (only?!? ), but it is just as good as the 3458A in every way other than that 8th digit precision. My 3457A is old enough to actually say “Hewlett Packard” on it, but is still stable and accurate as far as I can tell. They’re very nice bench meters, and can often be had more inexpensively than the 3458A because they’re not quite as collectible. I’m quite curious about the 3457A. I was a little put off by the fact that the 7th digit is not available on screen and has to be dumped from memory or over GPIB (if I understood correctly from mjlortons review https://www.youtube.com/watch?v=HfxpJCdgVwc). But it’s tempting as they can be acquired relatively cheaply. I do have the 34401A which is a nice bench meter (and I was lucky enough to pickup of 50USD faulty and then repaired). Nice! $50 for that meter is a steal and a half! Reminds me of my recent purchase of a fully functional Fluke 8050A for $5, though I think you ended up with the better deal. Dave Jones does a nice tear down of the 3457A in which he gives a lot of good info about it. I’m not sure (faulty memory), but I think he describes a way to display the 7th digit. Yup, I just did it, you simply set the “Digits Disp” to “7”, and you have 7 digits. Not sure if I learned that from Dave or from another Youtube channel, but it’s certainly not difficult to do. Whether it’s as stable as the 3458, I don’t know. I do know from my own experience that it is an excellent meter and more than sufficient for all but the pickiest hobbyist’s needs. If you can find one at a decent price, I doubt you’ll be disappointed. 3457A is nowhere near the 3458A in accuracy and long time stability. Has the ordinary LM399 reference. Also has weird input amplifier, 3V range is amplified by 10/3x to get into 10V range. Better, even cheaper 6-1/2 digit volt nut DVM is the 3456A. You’re probably right (I don’t know the details), but I’ve never had any issues with mine. It’s stable as a rock and still accurate as far as I can tell, despite not having had a calibration in many, many years. For those needing parts per billion accuracy it’s the 3458 or nothing. However, for the other 99% of us, the 3457 is more meter than we’ll ever need. Also, I didn’t say that the 3457 was the precise equivalent of its big brother, I simply said that it was a good meter that deserved a tip of the hat. I think I recall a video from Cypress about the first PSoc5 dev board and how it can bu used as a voltmeter that just 1 or 1/2 digit short of the HP meter. There was the HP, a Fluke, and the PSoC5 PCB. I sent that board to someone and have never found another. It used a 9V battery and good regulators and reference. I’m sure that helped in the performance of he hi-res ADC. I think Cypress took down the video when newer dev boards came out. Of course it was missing all the fantastic connectors and buttons on the HP. On the other hand, with a little programming the PSoc5 could be a voltmeter that makes really cool noises! It’s always interesting looking at the component costs. The 3458A costs about 10K USD. The LTZ1000 costs about 70USD in small quantities which I’d expect to be one of the more expensive parts. I wonder what the total BOM cost is. No doubt most of the cost is claiming the initial R&D expenses. I think there’s also an ASIC in there. Given it’s such an old design, I also wonder how much simpler a new design might be. The LTZ1000 still appears to be unmatched as a reference though. Perfect faux pas. Just perfect. 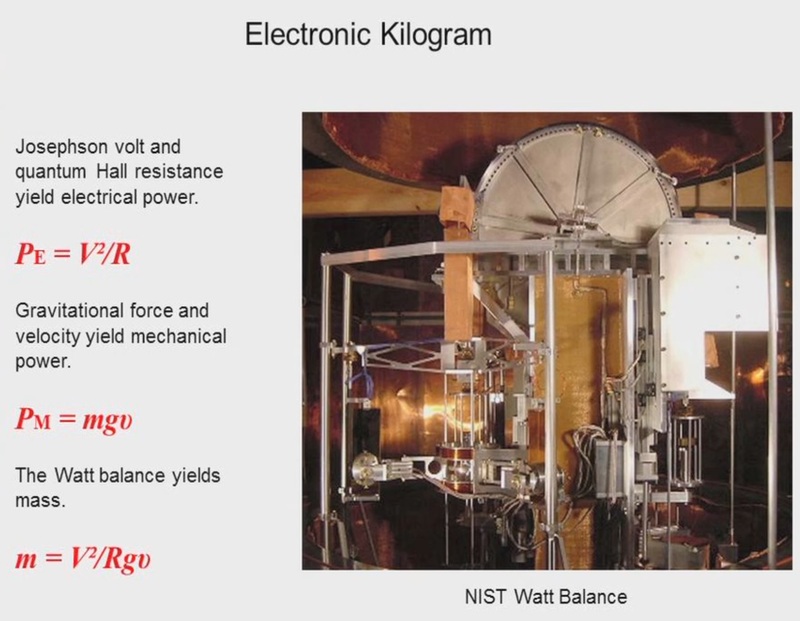 Defining the kilogram with an electromagnet working against gravity seems error-prone. How do you determine the acceleration of gravity without a known mass? Even worse, how would a moonbase set up their own reference kilogram? “How do you determine the acceleration of gravity without a known mass?” You don’t need to know the absolute value, just that it remains constant for the period of the experiment / measurement. You don’t need to leave Earth for local efforts of gravity to wreak havoc. Gravitational force is not uniform (or constant over time), which is why national labs measure it using gravimeters. You could determine gravity by the period of a pendulum. They probably have something a lot better than that, but this can be expressed as length/angular measurement and time. you can of course measure gravity without a known mass. Basically – look at the unit of gravity. From the idea, all you have to do is look at something falling. That’s it. Of course there are more precise setups like you could compare gravitational forces with centrifugal forces or one of the other accelerometric methods. Yeah. If by the “unit of gravity” you’re referring to earth acceleration — how are you going to get it from Newton’s Law of Universal Gravitation without knowing earth’s mass? A scientist for NIST in Boulder, Colorado, (years ago) built a gravity measuring device that detected the difference in gravity of a person changing their location around it. Good to see the link to the HP Journal. I used to love reading those, and learned a lot. Back in a time when development teams were not only given the time to properly engineer products but they got to document and share their work too. As an erstwhile metrologist I enjoyed reading this article. Wow, nice article. Brought together a few things I was aware of so I could see a bigger picture. A Worden gravity meter from the 1950’s and 60’s (a linear quartz spring I think) could tell you moved it further from the center of the Earth from floor to desktop. A Lacoste-Romberg with battery and temperature control (A Lacoste zero length spring), you could raise it about 5mm and read the difference. I suspect the gravity volt is a ratio and not dependent on g. But now I’ll have to read about it! Nice to see my LTZ reference :) Thanks for article. For those who interested of seeing 3458A’s guts – can read thru my repair worklog of one I got some time ago – http://xdevs.com/fix/hp3458a/. I’m a big fan of your worklogs and site in general. In particular the many Keithley repairs! Your attention to detail is wonderful! The watt balance shown in the picture is the old watt balance. NIST has – in the last two years — built a new version. A picture can be found here http://www.nist.gov/pml/div684/grp05/kilogram.cfm (link is also in the article). I can confirm that a programmable Josephson Voltages System is used as a reference in the watt balance experiment. In velocity mode, for example, the Josephson voltage and the coil are in anti-series, such that the induced voltage and the Josephson voltages cancel each other. The remaining small voltage is measured with a 3458A. Thanks schlammi, I’m so happy to hear that the 3458A is being used in the rig as well. It completes the story nicely.